So you’re planning a year Work and Travel Australia or looking for a Working Holiday in the great Australian outback – we can help you make it happen. We offer you an Outback Work and Travel program in the rural areas of Australia with guaranteed work and good wages for up to a year or more. Our program looks after everything from the time you are picked up from the airport, organising all your needs for living and working in Australia, and providing you with hands-on training to prepare you for work in rural and outback Australia. You will then be offered a range of farm jobs to suit your skills and experience, all over regional Australia. We put you in control of your Working Holiday in Australia experience – where you decide where and when you work, move from job to job or any mix of work and travel that suits you – with support from us for the duration of your working holiday visa. We can even help you extend your stay for a second year if you want! So if having a gap year and going to Australia, making good money and experiencing the outback is what you have been dreaming about – this is your opportunity! Our program guarantees work in Australia! Our training farm works closely with over 1,800 farm and rural businesses across Australia that are looking for suitably trained young people for both short and longer term work. With over 20 years of experience, the training farm makes sure you are job ready and matches your skills and interests with the many hundreds of jobs available. We have work on cattle and sheep stations, horse studs, cropping and mixed farms as well as country pubs, roadhouses and hotels in rural areas. The training you receive will prepare you for many of the farm jobs on offer and if you already have a technical trade, we have well paid jobs for a range of trade skills as well. If farm work isn’t what you’re after you can do domestic work, help with children or get a job in one of the many outback hotels or roadhouses. Why join our farm work program? Finding suitable, well paid work while holidaying in Australia is not easy. Most backpackers tend to travel and look for work on the coast and in the major cities where living costs are high. In most cases you have to travel to a job site just to apply, costing you time and money. Once you arrive, the job may not be suitable, you may not have the right skills or the job may have been taken by one of the thousands of other backpackers also looking for work. 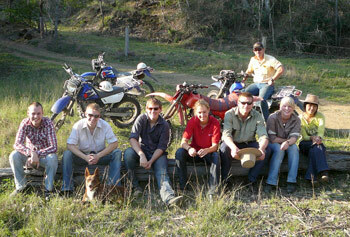 Our program specializes in preparing and placing you in jobs in rural and outback Australia. We can guarantee you work because our farmers and other outback businesses know that our training program will make sure you are suitable and prepared for ‘life on the land’. And because most farm jobs include accommodation and all meals, you are able to save money to spend on the rest of your travels. To participate in our Work and Travel program, you must be eligible for an Australian Working Holiday Visa or other working visa. This means you must be between 18 and 30 years old (Canadian and Irish citizens: up to 35), have a basic knowledge of English and hold a passport from an eligible country or region. Go to our ‘Prerequisites’ page for more details. "Work and Travel in Australia"
16 pages of facts about Work and Travel. Information about Australia, decision support, planning documents and and of course heaps of information about our farm work program in Australia. We would be happy to answer any questions you may have about our Work and Travel program. Is this program really for me? When can I start and what can I expect? How can I make it happen? Just ask us! We’re here to help. Just send us an e-mail or fill in the contact form and we will answer your questions as soon as possible. Alternatively, if you would prefer to talk to us directly, please let us know and give us your telephone number.